We have found Pindar a helpful and straightforward company to work with. They are fast, efficient, professional and offer a level of support to us we have grown to greatly appreciate, particularly in taking significant work off our hands at times when our workload is inherently much higher – The weeks before a major timetable change. We are looking forward to maintaining this relationship for many years to come. As with all bus operators, Metrobus is not immune from the current pressures facing the transport industry as a whole. Fuel costs are rising, the Bus Service Operators Grant is being reduced, and local authorities are being forced to kerb their spending in line with nationwide spending reviews. It is fair to say that as an industry we are being expected to rely less on the public purse to top up our income, and use better commerciality to increase our income levels through Modal Shift whilst reducing costs and expenditure at the same time. Surprisingly, whilst advances in modern technology have seen many people turn to the internet as a source of information, a large number of potential bus travellers will still look at the publicity at their local bus stop in order to help plan journeys. Bus Stop Publicity is therefore very much a window for the traveling public in to our business and what we do, and as first impressions count we really wanted to ensure that our Roadside Publicity was easy to understand, eye catching and equipped with the latest technology. 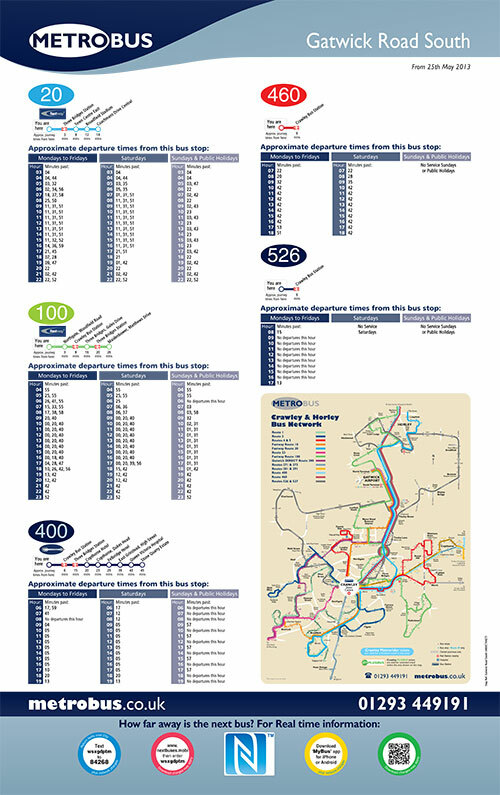 Keeping information up to date is also one of our most significant expenses – Updating bus stop publicity when timetables and/or routes change is a mammoth task, as is keeping information well maintained and presentable on an ongoing basis. Our challenge was to see how we could improve the professional appearance of our information sheets and incorporate the latest technology to better attract passengers, whilst reducing our costs at the same time. Historically, we had used a very manual approach to roadside information. In the weeks prior to a service change, we would manually print off thousands of stop specific timetables, maps, adverts, and general information “Filler” artwork. These would then need to be hand trimmed and laminated before double sided sticky tape was applied to the rear. In the few days before the change, we would visit each stop (sometimes many hundreds) and apply the printed and laminated artwork to plastic backing sheets inside the timetable cases. At some stops, we would spend a number of minutes getting the display right as existing artwork needed to be removed and rearranged in order to fit the new information in. It was a time consuming process and involved significant manpower – Preparing the new material was normally two weeks full time work for a member of staff without everything else we needed to juggle, and displaying it at the stops another full week of long days which on occasions would exceed 16 hours. It wasn't unusual for us to spend one whole day on a small number of stops – Crawley Town Centre alone could sometimes take several hours with the number of services which had their own pieces of artwork, and the number of cases at each stop which needed updating for every change. Not only was this method time consuming, but it also left much to be desired around our presentation and professionalism. And that was just the work involved in updating information for service changes. Several hours were spent afterwards monitoring bus stops for damaged displays, failed tape causing artwork to “Slip”, plastic backing sheets and timetable carriers discolouring and disintegrating over time and so on. The costs were certainly high, as was the pull on our staffing resources! We approached Pindar Creative having seen some of their work elsewhere and set about working on a project to reduce production and deployment costs whilst improving the quality of our displays. They told us about a service they offer where they could print “Posters” which would fit perfectly in each of our timetable cases without the need for miles of tape. These were waterproof posters produced with fade resistant ink and were designed to stay put for many months without the need for us to constantly check that none of the information had fallen inside the case. All we would need to do is to send them a list of the stops we needed posters for, and the relevant artwork/timetables in electronic format. We would provide them with a design concept for each poster to be used as a template as a one off exercise, and they would then arrange all the artwork neatly on each sheet themselves every time we needed a new set of posters. They would even deliver the posters in the order which we wanted to put them up, meaning that changing an entire route would take significantly less time on the road. The only large piece of work we would have to do was to audit and catalogue all the timetable cases on our network, their sizes and which cases were at which stops. Once that had been done, the only work we would have to do in preparation for a service change would be to identify the stops that we needed to update information at, and then pass this on to Pindar's design team with the artwork. Pindar also discussed some of the latest developments in technology with us. Our passengers have been telling us that access to Real Time Passenger Information is the best way to communicate with them about delays and disruption. Whilst the SMS text message services are helpful and had always been publicised on our artwork, the increase in usage of Smartphones opened up some new options. In our design we incorporated “QR” (Quick Response) codes and “NFC” (Near Field Communication) tags along with Mobile phone apps and the traditional SMS Text service. When a user scans the QR code, or holds their phone against the NFC tag they are immediately transported to the Real Time Passenger Information page on our website for that specific stop – A virtual RTPI screen on their phone, rather than a traditional electronic display screen for the stop. Whilst we continue to install these across our networks, the cost is very high and budget restraints mean it will be many years before we could achieve a screen at every stop, if at all. 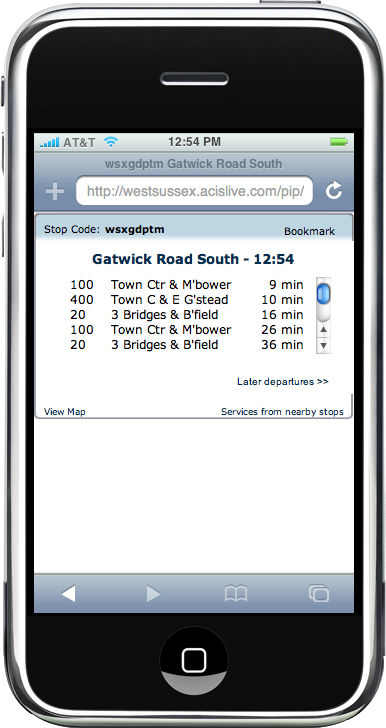 In the meantime however we have now introduced Real Time access for all our passengers at every stop we serve with a compatible mobile phone. As a result of the project, we have seen a significant decrease in costs from a number of aspects – Firstly our manpower costs have reduced where we are not spending weeks preparing artwork, hours arranging and rearranging displays at stops, and significant time and resource in constantly monitoring for deteriorating displays. Secondly, our production costs have fallen. Whilst producing and replacing entire posters for every change does involve a cost, it is by far outweighed by all the costs we have saved in materials used producing artwork (paper, laminate, fade proof colour ink, double sided tape etc). We have also had significant positive feedback from our passengers around our new design. Many have commented around how easy they are to read, how they look professional and eye catching, and the mobile phone RTPI usage has grown month on month in the year we have been working with Pindar – In April 2013 alone we had over 12,000 QR Code scans.